“In 2010 I made a handshake agreement with KUSTOM KID’S HOT RODS to totally rebuilt my 1950 Mercury Convertible which has been cruising the interstates “WEST” since 1979. 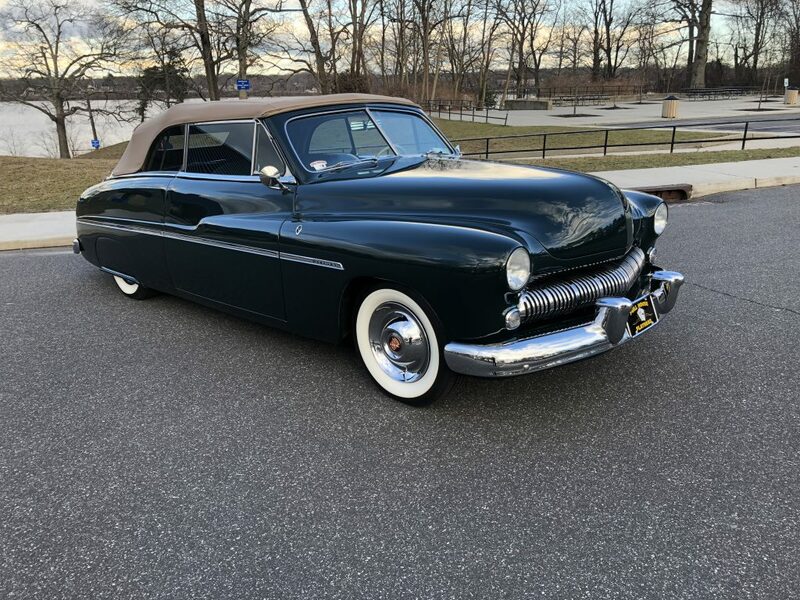 The Merc had to be a mild custom circa 1955. It had to be dark green and it must have a FULL HOUSE FLATHEAD V8!!! Anthony Bordonaro (aka THE KUSTOM KID) did accept this total soup to nuts rebuilt assignment but Anthony said one thing right away. NO more 4bbl carb, my new Flattie V8 would now have a Tri-Power Intake Manifold with New Genuine Stromberg 97s. Done Deal, bring on the STROMBERGS!! THE PERFORMANCE ENGINE SHOP, West Babylon NY got the assignment to build up my 1949-51 8BA block. Builder/owner GARY SHARKEY built and dynoed this Flathead V8 with the following specs; bore 3-5/16, stroke 4-1/4 for cubic inch displacement of 294 CID, 78cc chamber volume into Edelbrock cylinder heads (pn 1116) for compression ratio 8.26 to 1, Isky 88 camshaft. 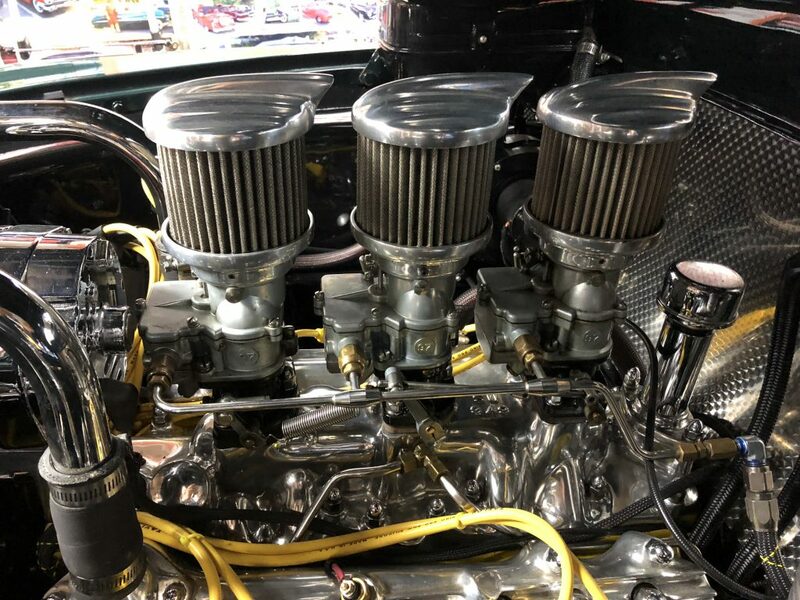 With Gary building the block it was time to call MIKE GOODMAN at HONEST CHARLEY SPEED SHOP for all the add on accessories; three Regular Stromberg 97s (162 CFM), Edelbrock tri-power intake manifold (325-1109), OTB GEAR Aero Top 2 barrel air cleaners with 3-1/4 filters, MSD Pro-Billet Ready-To-Run Ford Flathead 1949-53 Distributor (8573), Sanderson three tube 1949-53 Ford Flathead V8 Headers (FH-1), Electric fuel pump, Aeromotive Fuel Regulator (13301) with return gas line to gas tank to maintain the required 2.5 PSI max fuel pressure for the Stromberg 97 Carbs. KUSTOM KID’S HOT RODS finished this total rebuilt on my 50 Merc in August 2011. Anthony wanted me to put a thousand mile break in time before I headed west on a two week 2500 miles Road Trip. The last week of September 2011 the new and cool Merc headed to Indiana for the annual James Dean Run and The Duck Tail Run and other car related sites. At the James Dean Run, judging with one hundred other 1949-51 Mercs, my Merc won top prize, MERC OF THE YEAR, aka the 2012 Tee Shirt Merc. Then at the Duck Tail Run, judging with 2500 cars my Merc won Best Mild Custom. Over the next six years my 50 Merc traveled all over the Eastern States racking up 35,699 miles. This Stromberg powered Flathead V8 ran super with “NO” carb issues. In 2015 Anthony re-jetted the center Regular 97 Carb from .045 to .047 jets and added 1/4 inch Phenolic spacers. 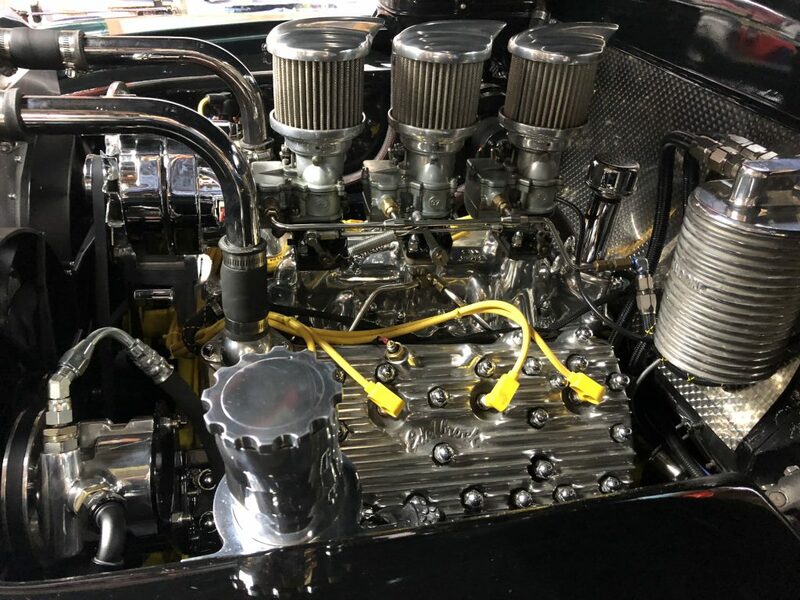 The Merc always ran good, but Anthony stated the Stromberg’s Regular 97 (162 CFM) was border line lean, running at its max on the Full House Flathead. Your Regular 97s would do the job pretty much for everything you need. But they may be a little near their max if you want to REV the Merc to higher RPMs. The New BIG97 external dimensions are the same as the regular 97 but have some 55% more air flow. The BIG 97 jetting (.056) will be close, out of the box, but you can check it out and tune it once it’s on the car. Check out online Tech Section on how to maximize intake flow for the BIG97. Cut away the center web between the two barrels (center carb location on this intake) for intake efficiency which is all about smoothing the passage of the air from carb to cylinders. Beware. Use the right high flow type air cleaners to avoid cutting down the airflow through these BAD BOYS, THE BIG97. The Kustom Kid states, “Say no more. Get what the Doctor ordered! A quick call to Summit Racing and Anthony had The BIG97 in his Shop within two days. On December 8, 2018 Anthony completeds PROJECT BIG97 Merc. Time for some road testing. My Merc’s Stromberg Tri-Powered Flathead now has a BIG97 (250cfm) for the center carburetor and the other two carbs are regular 97s (150cfm). The below mentioned notes are taken during a couple hundred miles of road testing done during the month of December 2018. First, the BIG97 started up right out of the box, idle great and also the accelerator pump action was a lot smoother. Yes Sir, the Stromberg gas line and progressive linkage again fit prefect now running the BIG97 with the two regular 97s. The BIG97 is the exact same outside dimensions as the regular 97, but completely redesigned internally. With the BIG97 now on my Tri-Power intake, Anthony was able to get the timing set at 10 degrees BTC, he also used the blue springs in the MSD Distributor for a quicker advance. The engine was now running with 18 pounds of vacuum. With our 2010 Tri-Power intake using three regular 97s Anthony could only use 6 degrees BTC, silver springs in the MSD Distributor with only 11 pounds of vacuum. Now it was ROAD TEST TIME!!! After a couple hundred miles this BIG97 update was much more then Anthony and I could ever dreamed!! The BIG97 with more air, fuel and timing advance had the Merc pulling first and second gear right over 3500 RPM, No Problem!! When shifting gears from first to second gear at the new found higher RPM range the dual exhausts are barking and rapping with power. You can hear and feel the big difference the BIG97 provides in power, with RPMs coming quicker and much stronger. Like Clive stated, the BIG97 gave the Merc more cruisability. Yes Sir, at highway speeds, just breathe on the gas pedal and it’s off to the races. Also at lower RPMs in any gear, second, third or overdrive fourth, again lightly touch the gas pedal and the RPMs climb with no problem. Just for the record, my Stromberg Powered Merc ran Regular 97s since 2011, racking up 35699 miles on them. The Regular 97s ran bullet proof, awesome, no leaks, no ‘oh shits’ and never missed a beat while The Big M was on all its Eastern States Road Trips. Both The Kustom Kid and Clive agree that using the Regular 97 as my Merc’s center carb was little near its max, not enough air-fuel for the 294 CID V8. Both Anthony and I could not believe or ever hope for the major improvement with my Merc’s performance with the BIG97 as the center carburetor. I really appreciate all the extra work and effort that team The Kustom Kid and The Clive Connection performed on my Merc’s PROJECT BIG97. The Highway’s white lines on Thunder Road will be a lot whiter while cruising my Merc in 2019. BOTTOM LINE…Always use New Genuine Stromberg 97 Speed Parts made in England, Quality with Modern innovation”.